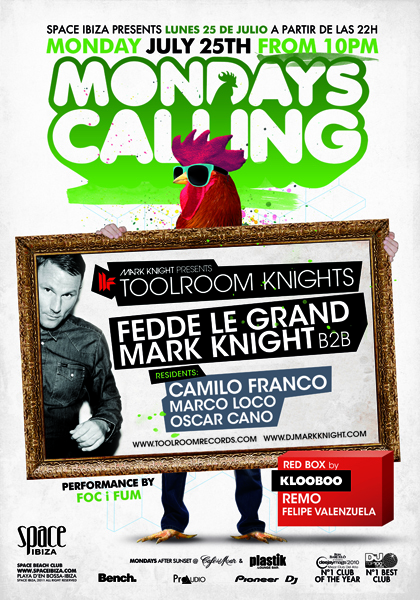 The Toolroom Knights Space invasion continues on Monday 25th July with one of the most highly anticipated line-ups yet – Mark Knight & Fedde le Grand back to back. If you haven’t seen these guys rock the 1’s & 2’s together before then this is the ideal opportunity to witness two titans of house music do battle against the infamous Space Terrace backdrop. This summer, Toolroom’s music making machine Mark Knight, brings the notorious Toolroom Knights to Monday’s Calling at Space Ibiza for an exciting new residency and with it a selection of the label’s most talented DJ’s for a more musically orientated party based on substance not hype. Hosting 10 parties throughout the season, Mark Knight is joined by some very special guests to include: Fedde le Grand, Sander van Doorn, John Dahlback, Tocadisco, Chris Lake, D.Ramirez, and in keeping with Toolroom’s mantra, which has always been to support new talent, you will also find the hottest new producers and DJ’s of 2011, including Jaguar Skills, Stefano Noferini, EDX, Kim Fai, Michael Woods…. On his Ibiza invasion Mark Knight had this to say… ‘I made up my mind that 2011 would be the year to bring the signature sound of Toolroom to Ibiza with a solid summer residency and Space seemed like the perfect place to start building. I’ve always loved the club having played there for many years… the sound system, the vibe, the people. Space Ibiza has always been about the music, and in my eyes seemed like a natural fit for Toolroom Knights. The fiesta begins as the sun goes down with a free pre-party throughout the season at the new Café Del Mar on the Sunset Strip. Worried you won’t be able to make it? Fear not! Tune in to Mark’s weekly Toolroom Knights radio show throughout the season (or listen again via the iTunes Podcast) to hear a selection of special broadcasts live from the dance-floor at Space. Soundcrash presents: The Nextmen at Koko.